Almost immediately after coming home from Dubai 70.3 in January, I realised that my next planned race in May was too long to wait. 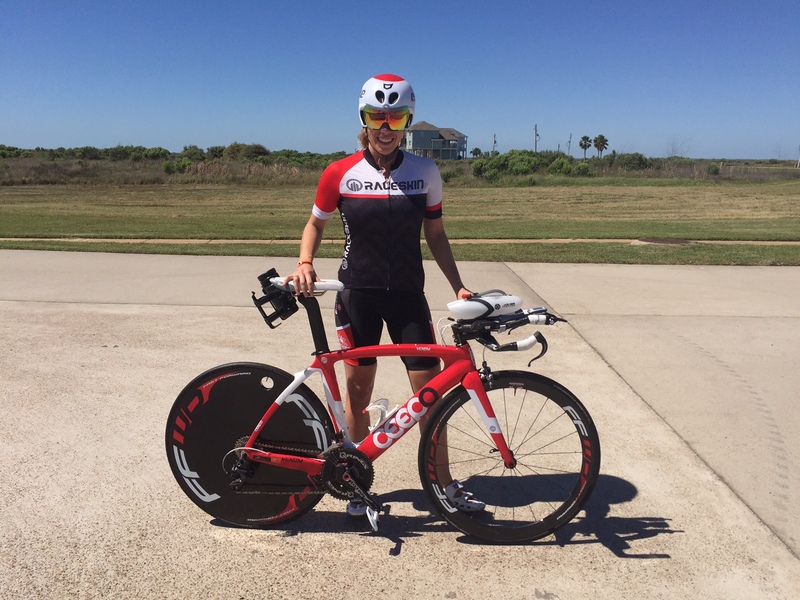 My pro friend Kim Morrison was convincing me that the course in Ironman Texas 70.3 would suit me well, and asked if I would like to join up with her for the race. It didn’t take much convincing. One flight booking later, and I was chatting through the plan with my coach now we had added in a ‘bonus’ race to the season’s calendar. The problem was that almost straight after Dubai, I had a week’s easy training to recover then a duathlon. Then an easier recovery week and then a half marathon. This period felt like a constant recover-taper-recover-taper cycle and basically culminated in me feeling perma-tired. After the half was out the way, though, we could focus on some decent training. And let’s not forget the training effect and adaptation from all the micro-races. That week we incorporated some of my favourite (cough cough) key sessions which combined intensity and endurance, but all was looking good. Mark, my coach, said to me I was in great form so we were feeling positive for Texas. As such, Texas came around unbelievably quickly (don’t all races do that!? ), and we were off. We decided to make it a bit of a flying visit by heading out on the Thursday, racing on the Sunday and flying home on Monday. Who said jet lag was a thing anyway!? A course recce two days out from the race went extremely well. I was having to hold back and was feeling really strong on the bike, enjoying the wall-to-wall sunshine and sea views. If only I wasn’t getting completely freaked out. I am a fairly frequent racer so it wasn’t the race itself which was bothering me – it was the weather forecast. Known for my aversion to bad-weather training and racing, I was more than a little perturbed by the projected storms, gale force winds, heavy rain, lightning, and “the chance of some mild tornadoes”. So ensued two days of constant weather checking, trying to find every weather forecast website imaginable in the hope of a favourable forecast. It wasn’t looking good. I had a panic chat with my coach about the fact that I’d only brought a disc wheel with me. Projected winds of 45kph with gusts of 60kph, even my training in Lanzarote wouldn’t put me in good stead in those conditions, especially on a disc. There were whispers of a race cancellation or course change, so it was all very up in the air until the day before the race, when we attended the briefing in the afternoon for clarification on what was happening. We were told of a backup plan to change the race to a duathlon if the swim course was unmanageable – the organisers remained pretty elusive about what would happen if the bike course was un-rideable, but they assured us that there was a plan in place to maximise our safety and preserve the integrity of the race. In essence, it was business as usual. I racked anyway hoping my bike wouldn’t blow away overnight, and off we went to have a pre-race dinner and glass of wine to calm the nerves. On race morning the weather looked as expected. Grey, extremely blowy, and a forecast of heavy rain throughout the morning. There was no mention of a swim cancellation and although the water looked a little choppy, I had seen (and indeed swum in) a lot worse! I was in a female age group wave roughly 50 minutes after the pros went off sop after a bit of hanging around, I was making my way off the jetty and into the warm water, ready for go time. The swim was annoyingly slow – not only because of the expected chop but also because we were catching slow swimmers from the previous waves – there seemed to be an awful lot of them, as well, and I’m hardly the fastest swimmer! I was surprised to see a swim time of 35 minutes but it was apparently a slow swim (all of my races seem to be slow swims these days!) and I exited the water 16th in my age group – out of approximately 130. Transition was a novel experience because it was just a ‘kit by your bikes’ policy which is unusual for Ironman races! As such it was a faster transition than normal – no bags, no racks, and no change tents. Just get it done by your bike. Heading out on the bike, I felt pretty good, despite the raging headwind that treated us in the first 10km or so. When we got out onto the coastal road, it turned into a raging sidewind. That was that for the next 70km then. I was surprised by how many people I was passing, and not just gradually overtaking either – I was travelling about twice the speed as a lot of them! I don’t think this is necessarily testament to my cycling ability – more like the calibre of participants at the race combined with a good bike position – plus I saw barely any women with disc wheels, so that will have helped! I was a bit down on where I wanted to be power-wise but pushed on anyway. Amazingly, the wind really wasn’t that bad – it felt like a normal day in Lanzarote so it’s a good job I’m used to cycling there. I didn’t even find the bike twitchy because I had a relatively slim front wheel on – the disc was absolutely fine. Even more amazingly, it didn’t rain! I was extra happy about that. Half way through the bike my power started to drop off a little. I was feeling really thirsty – more than usual during a race, so when I got to an aid station on the return stretch, I just filled my front bottle with water so I could try to satisfy my thirst. I was taking gels in my gel bottle and salt sticks so wasn’t relying exclusively on water, but realised at the end of my bike leg that I’d left my other bottle of energy drink untouched. I was also extremely uncomfortable on the bike - I had chronic lower back pain, which was forcing me to sit up every now and then – not what you want in gale force winds! I couldn’t wait to get off the bike, and make a mental note to book appointments with my chiro, biomechanics coach and get another bike fit! Although I wasn’t quite where I wanted to be, I finished the bike in 2:35 which did equate to my second fastest 70.3 bike split ever. Off the bike and I knew immediately something was wrong. I had already felt something was wrong on the bike as my power was around 15 watts off where it should have been, but as soon as I started running, this hit home like a hammer in the face. It was so bad, in fact, that I seriously contemplated pulling out at 5k because I had no clue how I was going to manage to get round a half marathon. All I wanted to do was lie on the grass – it looked so appealing. My legs just felt like lead, I felt completely sapped of energy. I think, on hindsight, this is what they call ‘bonking’, and incredibly, I’m not sure I’ve experienced this many times. My pace was appalling – it was roughly the same as a long slow chatty run I had completed a week before and around 45 seconds per km off my target run pace! I was grimacing, praying for every kilometre to be over. My thirst was weird – I was grabbing two cups of water at every aid station and downing them – I couldn’t seem to get enough water in me. I had a few gels and they were gradually making me feel marginally better but I knew by then that it was too late, I was a goner. The time slipped by, my target time was lost and I no longer cared – I just needed to get through it. It was no longer a time target, it was just survival. It felt like forever but I finally went down the finish line. Kim, who had won the race, hugged me and I burst into tears, disappointed and upset at my extremely under-par run. I did realise, however, that it was still my second fastest 70.3 time ever – at 5:05. But because I knew I had a much better run than that in me, and all the numbers in training had confirmed it, I was still really disappointed in myself at not having reached my true potential during that race. Over the next day or so, while revelling in Kim’s glory and enjoying all the celebrations, we did also chat through what happened during my race in quite some detail, concluding that I hadn’t taken on enough nutrition on the bike. In fact, I consumed half the volume of carbs that I should have. Coupled with possible dehydration, it just wasn’t happening. I had nothing. I needed to give myself a good talking to to appreciate that it wasn’t as bad as I was making out – I was 8th in my AG out of 130 and something like 22nd non-pro female overall. But I knew I could have done better and that’s what’s frustrating. You have to take the positives and learn from the negatives – in this game, and in the game of life in general, there will always be things that don’t go 100% to plan. I am now making appointments with all those people who can help me reduce the friction in my racing, to help eliminate some of those negatives and make sure I have a more positive race which better reflects my true potential.